In his book: The Jesus Dynasty, Professor James D Tabor joins the increasing number of scholars who assert that Jesus was far more human than the church would lead you to believe. Prof. Tabor also reminds us of the fact, universally accepted now, that first century Jews were expecting at least two major prophets. We continue the search for the identity of the last of these major prophets; and put to the test the proposition that he is no other than the prophet of Islam, Muhammad, peace be upon him. 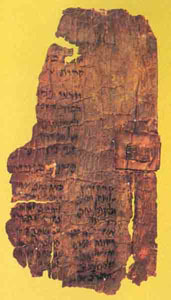 Having looked at the physical description of the chosen prophet, in some detail in previous posts; we continue to analyse these fragments of the Dead Sea Scrolls entitled: “The Chosen One” or “المصطفى“, for further information on the historical and circumstantial attributes of the expected prophet. This is highly significant, because Islamic tradition has always maintained a clear distinction between the words of Prophet Muhammad (ص), referred to as “Hadith” and the words of God or “The Quran” which Muslims consider to be the literal and pure words of God. Such a distinction can only be found in Islamic scriptures, and is unparalleled, neither in Christianity nor Judaism, for the Old and New testaments do not have clear dividing lines between the words of God and those of the prophets or even the writers and narrators of stories therein. He will not die in the days of evil, so this possibly excludes Jesus -as known in Christian theology- from being the subject of the document. Muhammad (peace upon him) triumphed against his enemies and did not die until his mission was completed. Who will write the words of God in a book that will not decay: Of all the Books claiming to be a revelation from God, the Quran stands out as the only book that : 1- Claims to be the literal word of God, and 2: has been truly preserved and did not decay in transmission. Whilst there is plenty of evidence of the corruption of transmission of the Bible and other sacred books, similar claims made about the Quran are but speculations and suppositions. His word will contain great wisdom: Muslims have cherished the words of the Prophet and many volumes have been written analysing every word, description, action, story about Muhammad () and Hadith became a large subject of Islamic Scholarship to extract wisdom from the noble mouth of Prophet Muhammad, peace be upon him. I will praise you: The very name of the prophet, “Muhammad“, actually means “Praised“, this in addition to God directly praising the Prophet in many verses of the Quran, as in [Quran 68:4] And verily, you are on an exalted character. We have the physical evidence of the moles on his back and the colour of his hair. We have a prophecy that he will defeat his enemies, that his message will reach the whole world and last until the end of time. We have evidence about him being unlearned and then suddenly acquires knowledge about the holy books, angels and prophets. Evidence of his great wisdom, that his message will be universal and directed to all the people; and that he writes- separately- the words of God in a book. I end this post with a little challenge: Can you find any individual in history who fits the description given in fragments 4Q534 and 4Q536 better than Muhammad, the Prophet of Islam? Jesus fits most of these predictions. We don’t know about the physical predictions, but if you read the New Testament, Jesus does not come from a wealthy family who sends him off to the best schools. He amazes people with his wisdom and authority. Even the religious leaders are at first in awe of him. Keep in mind, what you are reading is not scriptural, but mostly an interpretation based on the Old Testament. 1) Jesus’ death was the completion of his mission. Muhammad’s was not. Jesus rose from the dead, Muhammad did not. Or we could ascribe to the view of Islam that Jesus did not actually die. Either way, your point does not hold. 2) “Who will write…?” is a question, not a statement. The answer to that question could more easily be the Apostles than Muhammad. Not to mention we’re missing some of the text immediately before the question. The text immediately before talks of the prophet being sentenced to death and then asks who will write the words down. Jesus was sentenced to death, and his Apostles wrote the words down. 3) Jesus’ words have been considered wise by many from all different religious backgrounds (including Muslims) for two thousand years. Outside of Islam, there is not much respect for or knowledge of the wisdom of Muhammad. 4) If you read the New Testament, Jesus is constantly praised for giving his life. This has nothing to do with the meaning of a name, unless of course we are reading Muhammad into the text. You are reading Muhammad into these passages. Even if it may work, it doesn’t mean anything. These are not part of any scripture and are the views of men. Granted they were religious men, but these are not anywhere near on level with the Bible. 1jesus’s death was completion of his mission?? come on please his supposed ressurection was the completion of his mission, so point one fails. 2 the text immediately before the “who will write it” part does not in anyway say that it is the prophet that will be sentenced to death. Also the apostles did not write any of the gospels. 3 if you believe that Muhaammed pbuh has not been praised by non muslims than surely you are strengthing the stereotype that southern americans know nothing of things outsid thier own borders. I can quote you lots of sayings praisining the prophets from non-muslims but seeing as you are in america you would probabl;y think i made them up. 4″i will praise you” if this is God then i find it hard how trinitarian chrisitans can read this as appling to jesus since he will be saying he will be praising himself!!! I alsomforgot to mention if you read the entire manuscript in its many fragments you will also read that there will be plts against him that will fail and hi will rule over all thingsand his plan will succeed jesus’s plan never succeeded and his was killed (according to christians) and from there we habe whole new area of chritian re-interpretation of what the messiah was supposed to do and be but that is for another time. 1) Jesus’ resurrection was necessary, but his death was the climax of his mission, in accordance with Old Testament prophecy and the fulfillment of the sacrificial system and the Feast of Passover. His death paid for sin once and for all, so that all who confess with their mouth Jesus is Lord and believe God has raised him from the dead will be saved. 2) The apostles did write the gospels or contribute. Mark relied on Peter, John wrote his gospel, and Matthew was an apostle. Luke spent time traveling with Paul and probably knew other apostles. 3) I realize there are non-Muslims who praise Muhammad, but it is not to near the extent as Jesus. A small percentage of non-Muslims have any sort of respect for Muhammad, whereas people of all faiths generally respect Jesus. 4) The New Testament shows Jesus praising the Father and vice versa. This is not outside of the Christian understanding of the Trinity. There were many plots against Jesus that failed. Read the New Testament (i.e. John 8:58). Jesus is reigning on his throne in heaven at the right hand of the Father, but his kingdom is not like the kingdoms of this world (cf. Ephesians 1). In Jesus’ teachings on the kingdom, everything is upside-down. The meek shall inherit the earth (Matthew 5:5). The poor in spirit are blessed and inherit the kingdom (Matthew 5:3). The persecuted are blessed (Matthew 5:1-11). The things of God are often opposite of how we think (Matthew 16:21-28). This is not Christian reinterpretation. This is Jesus’ teaching, and the way the Old Testament Jews saw the world as well (i.e. Daniel, Isaiah, Jeremiah, Moses, David, etc.). Andrew, if Jesus/Isa (PBUH) is only a human prophet, what justice have you done to him? calling him a liar when his true teaching of one and only true God has been changed/misunderstood throughout history? In muslim’s shahadah : that there is no God but God (Allah) and Muhammad is only a prophet of God (Allah) – it is very clear to the muslims to believe that there is ONLY One God and Muhammad is only HUMAN, a prophet (to avoid the same misunderstanding). There is no need for non-muslim to praise Muhammad if they do not understand his life and teaching. There is no need for the christian to explain to muslim in order for us to glorify Jesus (as a prophet of god) The muslim must believe in the prophets of God in order to declare themselves as a muslim! This simple truth and strong theological principle (tawhid) of Islam (in the Quran) can last longer than what you or me or anyone else can ever explain/rambles in our lifetime. Reading misinterpretation one after another really sadden me. May you receive ‘hidayah’ in your struggle..
We haven’t misinterpreted the New Testament. Jesus makes SEVERAL claims to divinity. He regularly claims the ability to do things only God is able to do (i.e. forgive sins). He applies to himself the name God revealed to Moses in Exodus 3:14 in numerous instances (i.e. John 8:58). All of this is prophesied in the Old Testament. In Zechariah 12, the LORD says “they will look on ME, on HIM whom they have pierced.” Malachi 3 says that following the covenant messenger (John the Baptist), the LORD Himself would come into His Temple. Jesus claimed that He was the Temple, becuase He was God incarnate. John 1:14 says, “the Word became flesh and dwelt among us.” The Greek word for ‘dwelt’ is literally ‘tabernacled,’ which points back to the presence of God in the Tabernacle in Exodus, the forerunner to the Temple. It is undeniable that Paul explicitly claims the divinity of Christ. James attributes divinity to Christ as well. In chapter 1 of James, he begins his letter saying he is “a servant of the Lord Jesus Christ” (v 1). He goes on to tell the believers to ask God for wisdom (v 5). Then in verse 7 he says that what is received is from “the Lord.” He equates “the Lord Jesus Christ” from verse 1 with God in verse 5, by his words in verse 7. You can argue all you want from the Quran, but it is clear that Muhammad knew one thing: if Jesus was who the Christians claimed, then he was an irrelevant false prophet. Muhammad necessarily had to claim that Christians were wrong. Unfortunately, he didn’t know the Bible. He thought that Mary was a member of the Trinity (5:116). He also conceived of the Trinity as three separate gods (5:72). If you are basing your views of the Trinity on Muhammad, it is no wonder you disagree. No Christian would ascribe to the view of the Trinity Muhammad did. The entire argument is a straw man. Muhammad’s Trinity does not exist.